So let’s close the week with a great tip for storing cut up apples. K? K! If possible, put some fresh oranges on top of your apples. 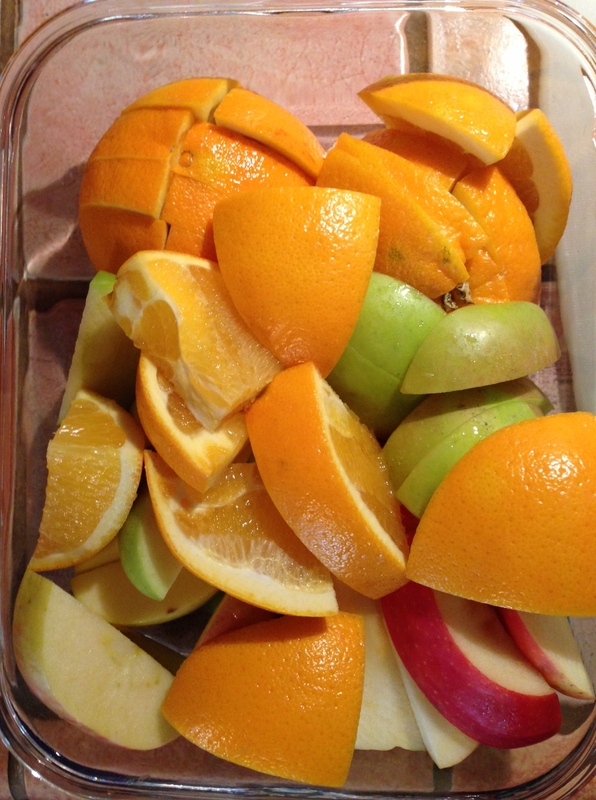 The acid in the citrus will help keep the apples from turning so brown. There. Done. Why isn’t the bleach solution (or whatever they’ve used) listed on the packaging? It’s because the lobbyists have found a loophole in the USDA regulations. Since the treatment is part of the “process” and not an “ingredient” it does not have to be named. Same applies to those weird like “bunny love” carrots that come in a bag. Hate to be Debby-downer at the end of the week, but apparently I needed to get this off my chest. There. Done. This time for the day. Have a FRESH weekend everyone! Here you see the remnants of my strawberries that taste great but are already turning soft (will have to talk with my farmers market vendor next week… just got these on Saturday! ), my oranges that Rhea says have “too much white stuff around them” and some on-the-verge-of-banana-bread bananas. And what does a economizing mama do with all the above ingredients? Cut off the “white stuff,” sift through the berries and toss a few pieces of each banana–and then make a fruit salad, of course. Served in the fanciest breakfast establishments, one would think that fruit salad is a tad high brow. But I have my suspicions that people more along the lines of my frugal Grandma Millie came up with this concoction. Many vendors at farmers markets have special buckets for people (yes–people like me) who are willing to cut out a spot here and overlook a mark there; and pay 1/3 the price of the pretty produce. For example, I often purchase organic apples for $1.25 lb just because they aren’t picture perfect. Then I chop’em up, throw out the few brown parts, and make apple sauce. 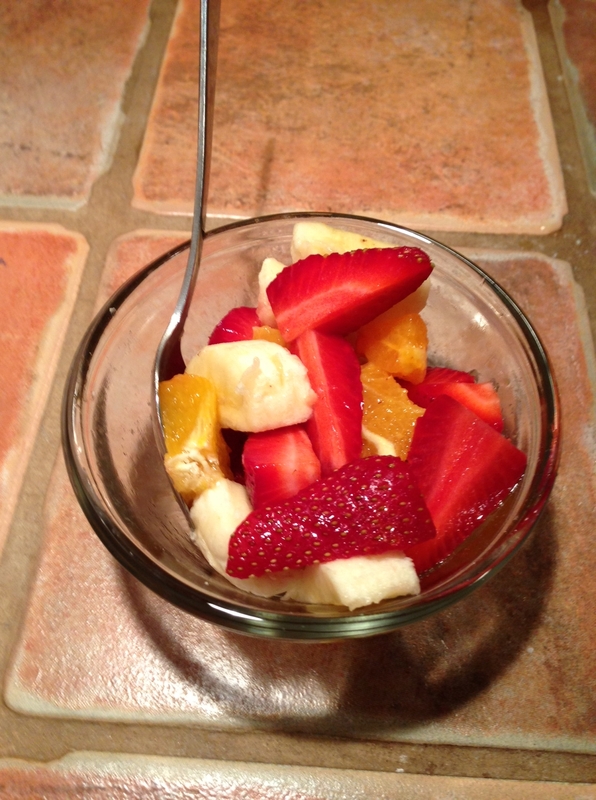 Beautiful, delicious, healthy, economical–these are some of my favorite things! I’ve been experimenting a bit this season with fruits in new culinary ways. Apples and pears are so divine right now at my local farmers market and at the grocery store. Last week I whipped up a turkey, provolone, red onion and sliced Bosc pear sandwich for Mike and me. On his I put some Coleman’s hot mustard and on mine I put some olive oil and balsamic vinegar. On both of ours we gave a thumbs up. Really nice combination. This open-face sammy is super tasty, healthy and easy to whip up/clean up. Just what a mama-on-the go needs to fuel her day! Some particulars: Years ago I made the switch from the hydrogenated peanut butters (like Jif, Skippy, etc…) as I had read enough to turn me off. It was tough at first to acquire a taste for the non-hydrogenated, natural peanut butters. I used to salt (sounds weird, I know, but it worked) our peanut butter sandwiches until Mike and I got used to the simpler flavor. Mike was a trooper as you can imagine how tired he gets of the “Honey! Guess what cool thing I learned to help us be healthier!” type conversations I have been known to start… Now both of us–and the kids who never knew any different–agree that when we eat the more conventional peanut butters it tastes like candy. Way too sweet. Do keep in mind, however, that although natural peanut butter is a healthier choice than hydrogenated and is a good source of protein, it’s still loaded with fat. Sigh… if only it weren’t I’d love to have about a 1/4 inch of it between my bread and apples… but smear is nice too. 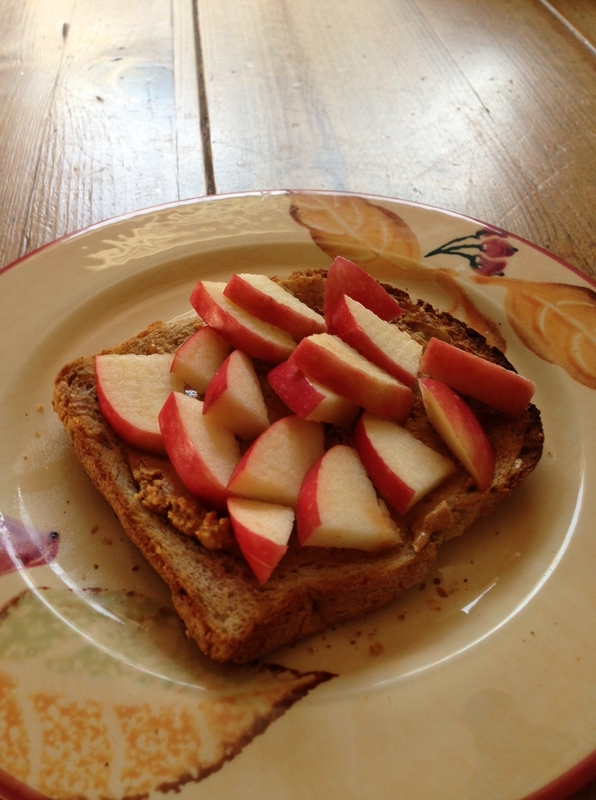 Finally, I used Pink Lady apples on this PB&A. Dessert? The other half of the apple!